With its focal point of popular teen fashion magazine models, idol group Yumemiru Adolescence was created in 2012. There are five members in the group: Karin Ogino (19), Akari Yamada (18), Yuumi Shida (18), Rei Kobayashi (17), and Kyouka (15). The group’s nickname is “Yumeado”. We’ve sat down with the group to ask them about what we can expect from their activities from here on out, including their major debut of “Bye Bye My Days” on March 18, 2015. – First, I’d like to congratulate you all on your major debut! – The song and MV this time around are different than anything you’ve done up until now, and they have a more polished feel to them. Is there something you focused on during the production process? Yamada: The staff that had a hand in the single was different than anyone we’d worked with before. Ogino: Up until now, when we’d be shooting a PV I’d think, “I wonder if it’ll look like this when it’s done,” but this time I really had no idea at all. We always shoot a lot of singing scenes, but this time there were even more. There were scenes where we’re just walking, or ones where we’re just looking at the camera, and all of us had no idea where they were going to be used. So actually, we were really moved when we saw the finished video. Kobayashi: When we got the music, I felt like it had that fresh start feeling just before spring, and I tried to sing it with a feeling of uneasiness and excitement. Yamada: I especially went into shooting it just being myself. It was such an important piece for our major debut, I just wanted to show my true self without any kind of flair. – When you first began, I think you had many cuter songs, but now you’ve been making more cooler, mature-like songs. What kind of song would you like to challenge now or in the future? Shida: I’d like to sing a ballad. “Himitsu” (“Secret”) is vaguely ballad-like, but I want to try a real ballad. Ogino: On the other hand, I want to sing something fun. 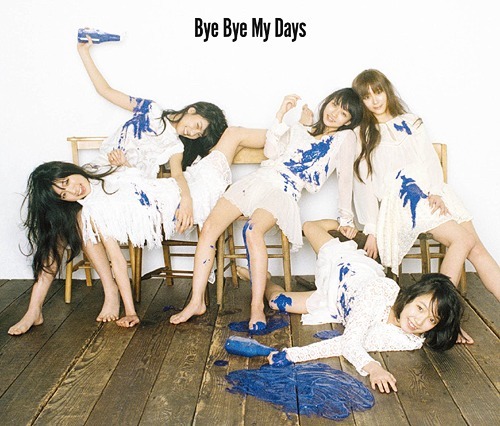 “Bye Bye My Days” is upbeat, but I want to try singing something different. I also think it would be nice to sing cuter songs. – Speaking of cuter songs, I love “DATE COUNT FIVE”. After seeing it live, I loved it even more. Kobayashi: The person that did choreographed the movements for this song is actually the same person who did the ones for “Himitsu”. They’re completely different from the movements in our other songs, so I think that maybe you can see a different side of us. Ogino: We didn’t do the movements for “Bye Bye My Days” until the morning on the day of the concert. We worked ourselves to death. We performed the song at the end of the concert, and during the live, I was like what am I going to do. – Even with all that nervousness going on, you were still able to perform. If you were able to work with someone completely different from your staff up until now, is there someone you’d like to work with or collaborate with? Ogino: I really like the world in AKB48’s “Heavy Rotation” PV, and I’d like to get Mika Nakagawa, who was in charge of that, to shoot us. Also, because I love Disney, I want to do a collaboration with Disney! (laughs) There’s quite a few idols who have collaborated with Disney, and it’d be great if we could, too. – That would be great! It seems the two of you would make a good collaboration! Is there a particular character you like? Ogino: Mickey. I really want to go to Disneyland in Hong Kong! I put the Mickey my Thai friend gave me from Hong Kong on my bag! So I want to be able to do a collaboration with Disney in Hong Kong! – I think everyone can see your real selves in “Bye Bye My Days”, but I think they’re also many people looking forward to seeing many different sides of you from now on. Do you have any future goals? Kobayashi: First, I want our tour finale performance at Nakano Sun Plaza on April 25th to be a big success. Ogino: This tour’s title is “#yumetomonowatour”. (#circleofyumetomotour) “Yumetomo” (“Yume friends”) are our fans, and we think it’d be wonderful to expand our circle of Yumetomo. This tour stops in Tokyo, Nagoya, and Osaka, but next tour it’d be nice to do a nation-wide tour, stopping in many cities, and making an even bigger circle of Yumetomo. – The overseas fans that come to your concerts and handshake events, which countries are they from? Yumemiru Adolescence , also known as YumeAdo, is a Japanese idol group formed in June 2012. The idol unit currently consists of 5 members, and made major debut on March 2015, with single "Bye Bye My Days".